Successfully Added Cesium - Triple SIM Unlocked Cellphone (Quadband GSM + 800MHz CDMA) to your Shopping Cart. Not only is the Cesium a remarkable cellphone for personal and business use, especially when it comes to dramatically lowering your cellphone bills, but you can also make a lot of money reselling the Cesium! Read on to find out how. One Great Phone: The Cesium avoids needless complexity with the ever popular candy bar form factor (made famous by Nokia). 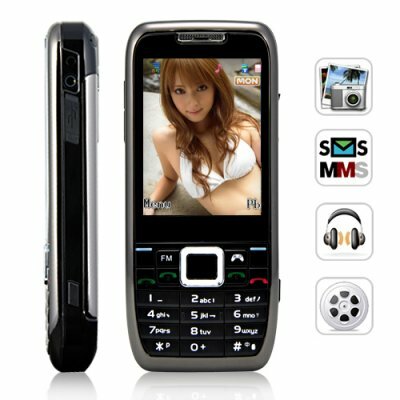 In fact, the Nokia level of quality is what we aspired to in making the Cesium. Attractive and well-built, the Cesium comes with every modern cellphone convenience you can think of: MP3 player, MP4 player, digital camera, digital camcorder, voice recorder, ebook reader, calculator, calendar, world time alarm clock, and much much more. Two Different Cellphone Technologies: The Cesium is the first mobile phone to provide instant access to TWO different mobile phone standards: GSM and CDMA. In terms of GSM networks, the Cesium is unlocked and will work with any worldwide GSM carrier. Note: GSM cellphone companies operate on either of the following four frequencies: 850MHz, 900MHz, 1800MHz, 1900MHz, and the Cesium is compatible with them all. More importantly, the Cesium is unlocked and will work with IS-95 networks, also known as cdmaOne, but more commonly referred to as just CDMA. CDMA uses the 800MHz bandwidth and despite being a first generation cellular standard, is still used in many parts of the world today. Calvin Tse works as an Art Director for a major advertising firm in Hong Kong but he lives in Shenzhen, China. This is an ideal situation for him because wages are much higher in Hong Kong, while rent is much lower in Shenzhen. So Calvin finds himself crossing the Hong Kong - Shenzhen border everyday. The commute takes him 45 minutes, but he uses the time productively to do work on his Apple iPad. Initially Calvin owned a dual-SIM phone. One SIM slot was used to hold his Hong Kong cellphone number and the other SIM slot was used for his China cellphone number. This setup allowed him the convenience of not having to switch his SIM cards as he crossed borders twice a day, but more importantly it allowed him to receive important China calls while he was in Hong Kong and vice versa. Calvin is a very sociable guy. Aside from companies contacting him constantly to do freelance work, he also has a million friends as evident from his Facebook page. His cellphone literally rings every 2-3 minutes. Unfortunately all this wheeling and dealing puts a severe dent in Calvin's wallet. On any given month, his cellphone bill is the equivalent of 700-800 USD. At dinner one night, Calvin's friend since highschool, Russell suggested that he get a China CDMA SIM card to keep costs down. On average, GSM calls cost 3x as much as CDMA calls. The reason being: CDMA networks use older technology and the call quality though very clear is not as crystal clear as GSM. "Thanks Russell," said Calvin spooning some Pad Thai into his mouth. The next day, Calvin bought a Cesium phone from Chinavasion. He kept his two existing GSM SIM cards for incoming calls, and added a third CDMA SIM card just for outbound calling. The result --- for the same level of calling, Calvin now pays only 200 USD in cellphone bills each month. The fact is, not many companies still offer first generation CDMA SIM card phones in light of GSM and 3G/4G evolution but all indicators suggest that the demand for CDMA is still there. On the website of the CDMA development group [http://www.cdg.org/worldwide/index.asp] is an interactive map which shows all the countries (lots of them) in the world still employing 800MHz IS-95 cdmaOne technology. We've taken the time to compile that list in our product notes below. Have a look. As a reseller you could tailor your marketing campaign to these countries specifically. Or list the Cesium on local ecommerce portals after translating your copy to the local language. The potential money to be made from the Cesium is limited only by your imagination. Countries still using 800MHz CDMA: Afghanistan, American Samoa, Bangladesh, Cambodia, China, Fiji, Guam, Hong Kong, India, Indonesia, Japan, Kazakhstan, Kyrgyzstan, Macau, Malaysia, Mongolia, Myanmar, Nepal, New Zealand, Northern Mariana Islands, South Korea, Taiwan, Thailand, Uzbekistan, Vietnam, Argentina, Barbados, Bermuda (UK), Brazil, Cayman Islands (UK), Colombia, Dominican Republic, El Salvador, Jamaica, Mexico, Netherlands Antilles, Peru, Trinidad & Tobago, Venezuela, Moldova, Ukraine, Angola, Cameroon, Cote d'Ivoire, Dem. Rep. of Congo, Equatorial Guinea, Ethiopia, Ghana, Guinea, Iraq, Israel, Lesotho, Liberia, Mauritania, Mauritius, Morocco, Namibia, Nigeria, Senegal, Sierra Leone, Sudan, Tanzania, Yemen, Zambia. The Cesium is unlocked and can be used with any cellphone carrier.